Contains: Synaptini, Ludius, Agrypninae, Denticollinae, Elaterinae, Thylacosterninae, Lissominae, Cardiophorinae. The Elateridae are the click beetles, so called for their ability to jump by rapidly bending the thorax (producing a clicking noise). Larvae of elaterids are liquid feeders on various foods by extraoral digestion; some phytophagous species, known as wireworms, are pests of crops. Members of the Elateridae have been divided between several subfamilies. These include the Negastriinae, characterised by the presence of two sublateral longitudinal carinae on the base of the pronotum, a short truncate prosternal spine, and a cordate scutellum that is deeply notched on the anterior margin (Calder 1996). The Hemiopinae are found in southern and eastern Asia, and possess a pair of short longitudinal ridges near the base of the pronotum (Bouchard 2014). Characters (from Lawrence & Britton 1991): Characteristic elongate form, with acute hind angles on prothorax and clicking mechanism enabling them to jump by forcing long prosternal process suddenly into cavity on mesosternum causing sudden movement of prothorax relative to hind body. Labrum always visible; frontal area usually with sharp transverse ridge between eyes; antennae almost always serrate; tarsi simple or provided with setal brushes or membranous appendages; fifth ventrite more or less free, membrane usually visible between it and ventrite 4. Larvae elongate and cylindrical to slightly flattened, either uniformly sclerotised and yellow to brown in colour, or more lightly sclerotised, except for head capsule, protergum and T9. Labrum and clypeus solidly fused to remainder of head capsule forming nasale, which is variously lobed or toothed; stemmata often reduced or absent; ventral mouthparts consolidated to form maxillolabial complex; tenth segment reduced and ventrally situated; T9 terminal. [C96] Calder, A. A. 1996. 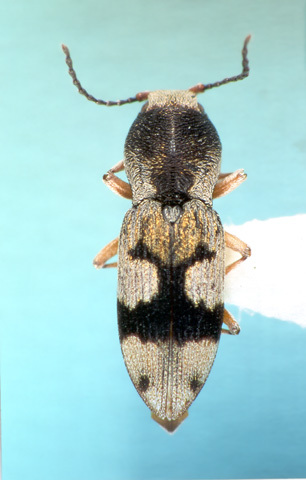 Click beetles: genera of the Australian Elateridae (Coleoptera). CSIRO Australia: Collingwood. [PS07] Platia, G., & R. Schimmel. 2007. Click beetles of Taiwan collected by the expeditions of the Hungarian Natural History Museum in the years 1995 to 2003 (Coleoptera: Elateridae). Annales Historico-Naturales Musei Nationalis Hungarici 99: 49–91. Last updated: 13 October 2018.